The man behind Discworld is so serious about being a knight that he made his own sword out of meteorites. Terry Pratchett is not only the best-selling author of the acclaimed Discworld series, but he's also a full-fledged knight (as of last year). However, he's taken his recent knighthood a bit further - and cooler - than most people would and made himself an actual sword. Apparently Pratchett didn't feel that the sword would really be his unless he produced the metal it would be created with. As a result, he found a field near his home in Wiltshire, England, and collected 81kg of iron ore. The author then smelted the iron at his house with a makeshift kiln built out of clay and hay, fueled from sheep manure. According to Pratchett, he also added, "several pieces of meteorites - thunderbolt iron, you see," to the mix. After he spent several days hammering the metal into bars, he took them to a blacksmith, whom he then assisted in creating the sword (which was then finished with silverwork). The finished product, seen at right, is clearly a beautiful work of art. 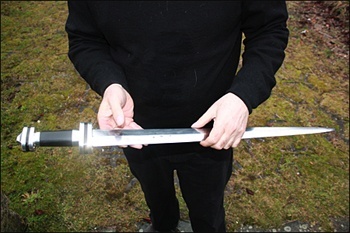 However, the author has stored the weapon in a secret location for the time being, mainly because he's concerned that the authorities will have a problem with him possessing a sword. According to Sir Pratchett, "It annoys me that knights aren't allowed to carry their swords. That would be knife crime." On a side note, Pratchett's daughter, Rhianna Pratchett, wrote the plot for Team Ninja's Heavenly Sword.